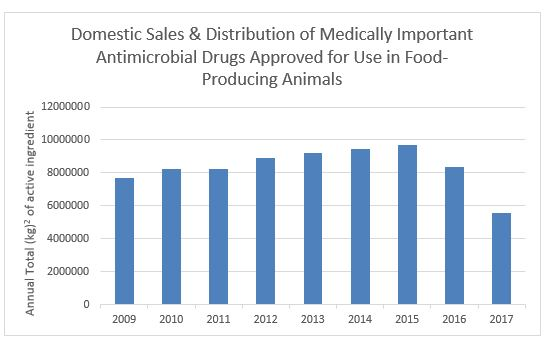 On Dec. 18, 2018, the Center of Veterinary Medicine (CVM) of FDA announced the publication of its 2017 Report on Antimicrobials Sold or Distributed for Use in Food-Producing Animals. This report is required by the Animal Drug User Fee Amendments of 2008. Under that law, every sponsor of an approved or conditionally approved new animal drug application containing an antimicrobial active ingredient must annually report to FDA the amount of each such ingredient in these drug products sold or distributed for use in food-producing animals. FDA must summarize this information and make it available to the public in annual summary reports. The data on antimicrobial drugs sales and distribution information are intended to assist FDA in its evaluation of antimicrobial resistance trends as well as its analysis of other issues that may arise relating to the safety and effectiveness of antimicrobial drugs approved for use in food-producing animals. The first report was published in 2010. Since that time, FDA has taken several measures to reduce the use of antimicrobials in food-producing animals. Notably, FDA issued Guidance for Industry (GFI) #213, New Animal Drugs and New Animal Drug Combination Products Administered in or on Medicated Feed or Drinking Water of Food-Producing Animals: Recommendations for Drug Sponsors for Voluntarily Aligning Product Use Conditions with GFI #209. Based on recommendations in this guidance, all production uses (i.e., non-therapeutic uses) of medically important antimicrobials were eliminated. As CVM mentions in its press release, this guidance was fully implemented early 2017. Since that time, medically important antimicrobial drugs can only be used for therapeutic purposes under veterinary oversight. The graph below suggests that FDA’s efforts are paying off. According to the report, between 2016 and 2017, the sale and distribution of medically important antimicrobials approved for use in food-producing animals that have an approved indication for production use decreased from 5,770,655 kg to 0 kg and the sales and distribution of medically important antimicrobials approved for use in food-producing animals that are sold over-the-counter, decreased from about 8 million in 2016 to 217,280 in 2017. Overall the reduction in sale and distribution of the relevant drugs decreased by 33% from 2016 through 2017 and by 43% from its peak year (2015). In its press release, CVM also stressed that the primary goal of its programs is no to reduce antimicrobial sales but “to support the implementation of good antimicrobial stewardship practices . . . to slow the development of antimicrobial resistance” and preserve the effectiveness of antimicrobial drugs. The importance of stewardship is recognized by the animal production industry. On the same day that FDA published its report, major food animal companies from across the supply chain—including retailers, livestock producers, and trade and professional associations such as Elanco Animal Health, Hormel Foods, Jennie-O Turkey Store, McDonald’s Corporation, National Milk Producers Federation, National Pork Board, National Pork Producers Council, National Turkey Federation, Smithfield Foods, Inc., Tyson Foods, Walmart Inc., and Zoetis —announced the publication of a “Framework for Antibiotic Stewardship in Food Animal Production.” Apparently, these companies came together as a result of a two-year dialogue moderated by the Pew Charitable Trust and the Farm Foundation. The framework is meant to apply across the animal supply chain.